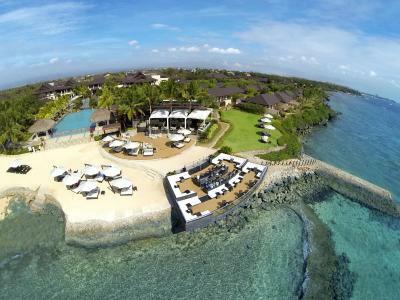 Lock in a great price for Crimson Resort & Spa - Mactan Island, Cebu – rated 8.7 by recent guests! The pool is clean, the staff even speak a different language so they are able to accomodate non English speakers, the staff are friendly and accomodating. Everything is very good. I’ll come again during the slow season for sure. Everything!!! The resort was perfect, the environment, the infinity pool was great, the staff were kind and helpful since the moment we arrived, we even got upgraded room :) the food was also great + what I found quite cute were the messages on our doorstep which we found each morning with activities planned for that day. There was even a shuttle to the city organized by resort. 10 + for this resort!!! Great pool in front of nice and small beach area. Facilities were clean and plenty to do on property. Excellent resort... They upgraded us to pool villa at check in... very appreciated... the food was Superb... Some of the best and most creative I have had in the Philippines. The Salmon Carpaccio at Azore was unique... I must point out that the staff at Azore especially Noel was one of the finest Capitan‘ Si have seen at any restaurant any where... knowledgeable of both the food and wine and was able to recommend and even guide us where dishes were not outstanding... so honest. At night we had the same experience with Grace at En-ye the Spanish restaurant... also superb service and professionalism and Ivan the chef came out for a great discussion of Spanish food and he introduced us to Iberico Chorizo. I can not recommend this resort enough.... Beautiful accommodations, professional staff, amazing food and great value. All the amenities that were available to the guests. We really amaze with your staff at the check in counter named Madelaine Z. Aguas. She upgraded our accommodation from Deluxe Garden to Private Pool Villa because we check in late around 8PM at Crimson hotel. Very nice and helpful staff in the restaurant, really nice food. Comfortable and clean rooms. Crimson Resort & Spa - Mactan Island, Cebu This rating is a reflection of how the property compares to the industry standard when it comes to price, facilities and services available. It's based on a self-evaluation by the property. Use this rating to help choose your stay! One of our top picks in Mactan.A posh hideaway in the island of Mactan with a private beach, an infinity pool, and a spa facility, Crimson Resort & Spa - Mactan Island is a 5-star resort located 11 mi from SM City Cebu and 12 mi from Ayala Mall in Cebu. WiFi is also available throughout the resort. Decorated with pleasant neutrals, tropical-style rooms feature classic wood furnishings and a comfortable arm chair. They have a private balcony and a bathroom with an over-sized window. The rooms are also equipped with air conditioning, a LCD flat-screen cable TV, and a personal safe. All rooms are also equipped with an electric kettle, a wardrobe, and bath amenities. Some rooms at the resort feature a pocket garden or a private terrace with a plunge pool and views of the sea. Offering views of the infinity pool and lush gardens, Saffron Café offers a buffet featuring a range of Western and Asian dishes during lunch and dinner. Score Sports Bar features light snacks and refreshments. Located by the beach, Azure Beach Club features an Asian Grill restaurant with day and night menus, a beach lounge area and a rock bar by the cliff for sundown cocktails. Enye specializes in Spanish Cuisine while providing a modern and family friendly ambiance. 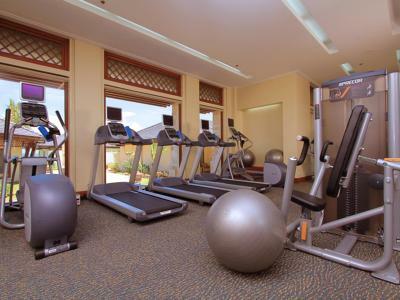 Start the day with a calming yoga class or a refreshing workout at the well-equipped fitness center. For leisure, go on an island tour organized by the resort's staff. Other facilities include a pool bar where snacks and home made ice cream are served. Guests can also enjoy a relaxing massage at Aum Spa while kids can choose from a variety of indoor paid activities such as figurine painting, bracelet making, or have fun at the game cove the playground. Staff at the 24-hour front desk and concierge can assist guests with tours and tips on how to go around the area. Laundry, dry cleaning, and ironing services are available. There is meeting and banquet facilities at the property. Airport shuttle services may also be arranged at an additional cost. Magellan's Cross is 15 mi from the resort while Temple of Leah is 18 mi away. The nearest airport is Mactan-Cebu International Airport, 6.2 mi from Crimson Resort & Spa - Mactan Island, Cebu. This property also has one of the top-rated locations in Mactan! Guests are happier about it compared to other properties in the area. 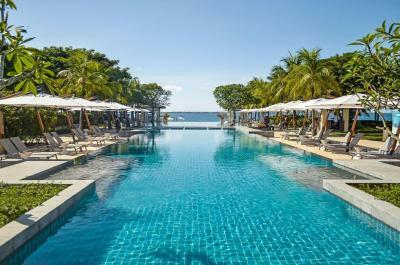 When would you like to stay at Crimson Resort & Spa - Mactan Island, Cebu? Features a balcony overlooking the garden and walkway, this room is equipped with a 42" LCD TV, a personal safe, and an open-plan bathroom with separate shower and tub. Each room also includes tea/coffee maker, a mini-bar, and an electric kettle. Connecting rooms are also available upon request, subject to availability. Offering views of its own pocket garden, this air-conditioned room has a terrace with a seating area. The room is equipped with a flat-screen cable TV, a personal safe, and a work desk. The room also has a wardrobe, a mini-bar, and an electric kettle. Offers exclusivity with a plunge pool, a dedicated villa host, and a spacious bathroom with twin vanities. Standalone villa features stunning ocean views, a plunge pool and luxurious bathroom with twin vanities. House Rules Crimson Resort & Spa - Mactan Island, Cebu takes special requests – add in the next step! Crimson Resort &amp; Spa - Mactan Island, Cebu accepts these cards and reserves the right to temporarily hold an amount prior to arrival. Crimson Resort & Spa - Mactan Island, Cebu accepts these cards and reserves the right to temporarily hold an amount prior to arrival. Breakfast was very busy, meaning we didn’t always get quick service, it was always with a smile though. The place seem to have a smell coming from a swine farm. It's a bit far out from everything but it's good if all you want to do is chill on the premises. There are designated places for smoking, you can't even smoke outside your room. I was a bit worried about its size based on the golf cart ride from reception to my room, but it's actually not too big for walking around the place. Got an upgrade so that was awesome , but generally it's really great, including the spa. Beach was good and staff was always very helpful and friendly. All of them. The beach was dirty even though Crimson staffs kept cleaning it. Pools were very hot maybe because of the weather. Breakfast was really good. Staff were very accommodating. Rooms were very clean. Transaction was fast. I was even given a complimentary wine for booking thru booking.com. Really appreciate my stay in Crimson. Would love to come back and stay longer next time. lesser food variety small area. not the best location to go around the city. the beach a bit of a retouch. good facilities, has everything you need. friendly, and very helpful staff. Hospitality was exellent. Children's facilities second to none. there are dozen of mouse playing in the ceiling that bothering during the night. I missed some sleep on our first night that ended to room transfer the next day. The air conditioning is leaking, and the water of the bathtub is yellow at the first five seconds ( it turns normal afterwards). The swimming pool is awesome. The facilities are good as well.